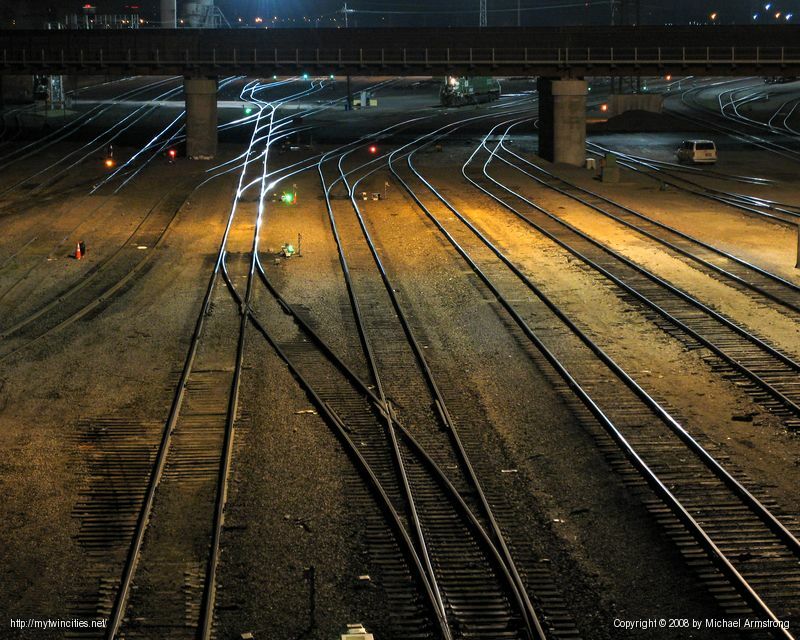 I drive over these tracks fairly often; most of the time when I'm headed home after a concert. If there isn't anyone behind me I'll drive very slowly across the bridge just to see the tracks and the signal lights along the ground. On very rare occasions they'll still be doing switching operations late into the night, but there typically doesn't seem to be much life after 10pm. Just a hair South of this bridge they have 20 or so engines just parked for the night. Canadian Pacific has a switchyard just a bit East of here, it's the place where the CP Holiday Train makes its Minneapolis stop. The location is a Burlington Northern switch yard and the photo was taken from the St. Anthony Parkway bridge just West of University Avenue.